Stylish loft available in the historic Jackson Ateliers building in the heart of the Old City. High ceilings with exposed timbers, hardwood floors and exposed brick. Spacious and bright great room. Large, open kitchen with gas range, granite countertops and plenty of storage. Parking available for $35/month in adjacent lot or $60/month for space inside building; subject to change. Square footage provided by appraiser & is an estimate only. Buyer to verify size. Location: Located at the corner of Jackson Ave. and S. Gay St., just around the corner from the restaurants, cafes and art galleries of Gay St.’s “100-Block”. Traveling north on Gay St., cross over Summit Hill Dr. and enter the 100-Block. Just before the bridge, take a right onto W. Jackson Ave. 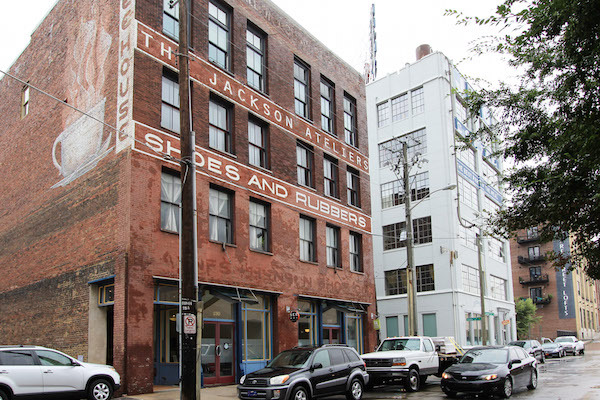 The Jackson Ateliers Building is the brick building on the right just past the JFG Flats and JFG Market. Don’t miss the hip new restaurants and cafes along Jackson and around the corner on Central.